3. Vocation is individual, personal, and inter-personal. The unique task that each is called to carry out to build the kingdom depends on our situation, the people we meet, our gifts, our limitations. Each of us lives in a unique set of rela­tionships, and each is the only person in that situation, so each of us can bring that little bit of the creation to its fulfil­ment in Jesus Christ. This calling is personal and is related to persons. The analogy is a family group: each must playa dif­ferent role in keeping the group happy; and if one person fails in that work, the whole group suffers. So it is in our other relationships: if the kingdom brings peace and forgive­ness, I may be the only person in a situation that can promote this here today. And on a larger scale, each has a unique set of gifts which can help those around them – if she the chooses to use them – and these build up the Body of Christ. However, we do not discover our different vocations as lone individuals. We discover our personal and unique contribu­tion to the building of the kingdom in relationship with other people: those people around us with whom we live in a series of relationships. I discover my vocation within a set of inter­personal relationships of needs and gifts. Discovering my vocation makes me more truly human, and helps me to grow in true awareness of the humanity of others. Vocation is not taking a job with a fixed job specification: it changes as our lives change, as we change through growing older, and as the needs of the society within which we live change. What one was called to do at one time may be very different to what one is called to do at another time. Each of us has to be listening for what we are called to do today. It is not that there is one moment of hearing a call and then that is the task for a lifetime – just think how such a static notion is untrue to the reality of how our lives unfold. Because vocation is unfolding we have the harder task of being continu­ously listening to what new vocation we have in the life we live at that moment. 7. Vocation may embrace a formal ministry, but ministry is not be confused with liturgical abilities or canonical status. In church there will be people who have the skills within body of Christ to serve their fellow Christians with the lie skills they need as a church. These skills will then fall . . the specific vocations of the members of that church, every member of that church has a vocation whether or ‘ttis a specific skill for the community. If faithfulness were a businessIn a certain church there was a man in the choir who couldn't sing very well. The choir director suggested that he should leave the choir. Others suggested that he be given more time to improve. The choir director then decided to go to the pastor and complain. "You have got to get that man out of the choir or else I am going to resign." So the pastor went to the man and said to him, "Perhaps you should leave the choir." "Why should I leave the choir?" the man asked. "Well," said the pastor, "four or five people have told me you cannot sing." "That's nothing," the man replied, "forty or fifty people have told me you cannot preach!" -Our lives are a mixture of strengths and weaknesses. This weekend readings talk about 'strengths and weaknesses' and how God can make use of the most unlikely people to fulfill the divine purposes. What an encouragement to all who hear today's readings! God can choose the not-so-good people to be the messengers of His words. This can give great comfort to any of us who try to be ministers and speakers of his words. God does not need our capability but availability! Reverend Billy Graham tells of a time early in his ministry when he arrived in a small town to preach a sermon. Wanting to mail a letter, he asked a young boy where the post office was. When the boy had told him, Dr. Graham thanked him and said, “If you’ll come to the Baptist church this evening, you can hear me telling everyone how to get to heaven.” “I don’t think I’ll be there,” the boy said. “Why?” Billy Graham asked him. “Because you don’t even know your way to the post office! How can you show me the way to heaven?” Today’s readings tell us about the calls of the prophet Isaiah, Paul, and Peter to God’s ministry. 2: "Well, I'm a student of physics." I love the story that is told of a sophomore who worked in the library at Princeton to earn money to help with his education. One night about closing time, he was walking around the empty halls of the library when he noticed in the very back corner amid an old stack of books, an old man reading and taking notes furiously. The old man was very intent. The librarian became a little curious so he went back to the old man and said, "My, what are you studying so intently?" The old man looked up long enough to say, "Well, I'm a student of physics." The young librarian said, "Well, last year I took a course in physics and I think I have all I need for an understanding of physics." He then turned and walked back to his desk. You can imagine his chagrin a few minutes later when the old man checked out some books, and on his library card was the name Albert Einstein. God's call is a calling to a process, not a single task. Today’s scripture about the call of Isaiah, Peter and Paul remind us that our calling is to a lifelong process of obedience, service and surrender to God, in which we grow daily more like Jesus. There is nothing in the world more joyful than that. There is nothing in the world more challenging. One day, author and educator Howard Hendricks was on a plane that was delayed from takeoff. As passengers became irritated and demanding, Howard noticed how gracious one of the flight attendants continued to be with each passenger. When they were finally in the air he continued to be amazed at her poise and control. When she came by his seat, Howard asked if he could write a letter of commendation to the airline on her behalf. “I don’t work for the airline,” she replied, “I work for Jesus Christ. My husband and I prayed this morning that I would be a good representative of Jesus Christ on this flight.” Do you have a career or a calling? You see, somewhere out on Lake Galilee, a handful of fishermen were transformed in such a way that they would eventually change the world because Christ had come and had given them a mission for eternity. 4) "Hop into my wheelbarrow. I'll wheel you across!" There's a wonderful story of a tightrope walker, who was challenged to walk a tightrope across Niagara Falls. Everything was in place. There were huge steel struts on either side of the canyon and a strong, steel tightrope. There were television cameras, reporters and a massive crowd. But there was no safety net. The tightrope walker appeared with a wheelbarrow, which he had decided to push in front of him across the rope. The crowd cheered him on, although some begged him not to make this foolish attempt. One voice in the crowd was more vociferous than the rest: "Go on! You can do it! I know you can! Don't listen to these pessimists. I have complete faith in you." The tightrope walker turned to the speaker and asked, "You have faith in me? You're certain? You know I can do it?" The speaker emerged from the crowd and nodded. "I'm absolutely certain. I have no doubts at all. You can do it!" "OK," said the tightrope walker. "Hop into my wheelbarrow. I'll wheel you across!" Amazingly, the speaker climbed into the wheelbarrow. And the tightrope walker wheeled him safely across to the other side. What incredible, courageous, foolhardy faith! Today’s gospel describes Peter's leap to a much deeper and stronger faith in Jesus and His ministry through Jesus’ response to Peter’s trusting obedience, His gift of a miraculous haul of fish at the Lake of Gennesaret. A man had spent fruitless day fishing. He didn't want to go home empty-handed. He decided to stop at a local fish market. "I'd like three good sized fish," he said to the clerk. "But before you wrap them, toss them to me, one by one." The clerk looked puzzled at his request, "Sir? That's a strange thing to ask." Smiling the man said, "This way I'll be able to tell my wife truthfully that I caught them!" 6. “I am a fisher of men." The Reverend Dr. McStuffedshirt encountered one of his less-than-faithful parishioners returning from a day's fishing and engaged him in conversation. "Ah, Brother Jones," he began in his best preaching tone, "You are a fine fisherman, but I am a fisher of men." Jones, determined to get home after a long day, replied, "So I have heard. But I was passing your church last Sunday, looked in the window, and noticed you had not caught too many..."
The pastor was a fisherman, but he hadn't fished in months. One perfect Sunday morning he couldn't resist. He called up his associate priest and claimed he had laryngitis. The priest then headed out to his favorite spot. The hook hadn't been in the water five minutes before he got a strike, and landed the biggest fish he had ever caught - although he had seen bigger ones caught by others. A half hour later, he caught the biggest fish he had ever seen. Another forty-five minutes later he landed a fish that broke the world record. All this time St. Peter and God have been watching the priest from heaven. St. Peter turned to God, and said, "How can you reward this priest? He lied. He doesn’t observe Sunday obligation." God smiled at St. Peter, and replied, "I'm punishing him." St. Peter was confused, so God continued, "Well, after he finishes, whom can he tell his story to?" Three ministers were out on a lake fishing one fine afternoon in a boat, a Protestant minister, an Episcopalian priest and a newly-arrived Catholic priest. They were sitting out in the middle of the lake and the Protestant minister said he had to relieve himself, so he got out of the boat and walked across the water to shore, relieved himself behind a tree. Then walked back to the boat. The Episcopalian priest did the same thing. The Catholic priest thought to himself, if they can do it, so can I. So he stepped out of the boat and started sinking. After saving him and bringing him back on the boat one minister commented: "We should have told him where the rocks are under the water!" 9. The Tony New Yorker magazine ran a wonderful cartoon of a psychiatrist and his patient. The caption has him saying to her, "Madam, please do not get angry. I'm only trying to save you money. You should feel guilty." The late Archbishop Fulton Sheen said that instead of becoming penitents many of us become patients. The Lake of Galilee possesses a picture postcard beauty. If you were to rent an Air Chance helicopter, you would see a pear-shaped body of water about thirteen miles long and eight miles wide. It enjoys almost a tropical climate. In the time of the Christ, there were ten prosperous towns situated around the lake. Almost all of those people made their living from the waters in front of them. Thus, one gets an idea of how rich the lake was in fish. This point makes it difficult to understand how the professional fisherman Peter and his companions had come up empty the night before. All they had caught were bad colds, a pair of old sneakers, some empty bottles, and crabs dead from advanced old age. Some years ago I swam in the Lake of Galilee. I watched Jewish teens water-skiing on its surface. I wondered if they ever recalled that a fellow Jew had once walked on the same waters without skis. Early morning Peter and his people were cleaning their nets on the shore. At the same time, Jesus was well into His long workday. He was preaching to huge crowds on the beach. Because of Cana and several other miracles, He had become an reluctant celebrity. The village synagogues were no longer large enough to hold the people anxious to hear Him. So, He preached on the beaches. The Teacher was not bound to old methods. He was willing to try new ways of reaching people. If the mountain would not come to Jesus, He would go to the mountain. We should be as enterprising as He. The mob was so eager to hear Him they were pushing Him into the lake for an unwanted swim. Jesus had to be an awesome preacher. When was the last time you fought for ringside seats to hear a preacher? Quickly the Nazarene jumped into the high bow of Peter's large boat drawn up on the sand. He had to have been in wonderful physical shape. There was very little chance that He was overweight. And you were thinking of not exercising today or not beginning that long overdue diet, were you? The bow became His pulpit. Once His instruction was finished, He ordered Peter to cast off. He was about to give him a payback catch. Even for Jesus there was no such thing as a free meal. We can thus assume that He will likewise return us dividends whenever we freely cooperate with Him. Before the miracle catch, Peter addressed the Christ as Master. He was but an interesting rabbi but nothing more. But then the nets were dragged into the boat overflowing with fish. At that point, Luke stresses Peter was no longer on his feet but on his knees. And this time he called Jesus Lord. It was not that Peter was an incisive theologian. Rather, like all his fellow Jews, he believed that anyone who possessed control over the waters also possessed divinity. Such a man had to be the Messiah. Notice too what Peter says: "I am a sinful man." The Wall Street Journal carried an article that posed the question: "When was the last time you had a good conversation about sin?" Most of us would have to reply that we no longer have such discussions. We have become sinless. If so, one should not wonder why the world is in the state it is. Why not examine your conscience against this benchmark by Fr Joseph? In the home Christianity is kindness. In business it's honesty. In society it's courtesy. In work it's fairness. To the unfortunate it's sympathy. To the weak it's help. To the evil it's resistance. When a preacher speaks about sin, do you shrug and conclude he is speaking about someone else? If affirmative, I respectfully suggest you reflect on The New Yorker cartoon. Perhaps you should feel guilty. Are you Fulton Sheen's penitent or patient? When was the last time you were at confession? 10. When we installed a shower heater in the Retreat House we ran into some trouble. It has an element in it that heats up. If a lot of water passes over the element the water does not get very hot. If there is little water it will get very hot. Since we got it, almost every new user has blown the safety mechanism that cuts off the water when it gets to a scalding temperature. When they feel the water getting hot they turn the switch down, when what they should do, to make the water cooler, is to turn it up. This to me is a good analogy of what happens often in our dealings with God. What we instinctively do or expect is the reverse of the divine way. We see this especially in the choice of leaders. We would expect God to choose the best and only the best people for leadership positions. Yet, the people that God chooses, and the Bible makes no attempt to conceal the fact, are often the most unlikely ones. Moses was a hot headed murderer before he was called to lead the people. David, the Royal Psalmist, was first of all a spoiled child and later an adulterous autocrat. In today's readings we see God call Isaiah to be his prophet who says "What a wretched state I am in! I am a lost man, for I am a man of unclean lips." 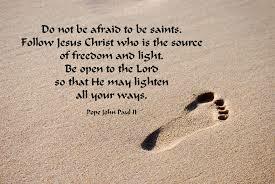 Then there is St. Paul who can never forget that he was persecuting the Church when the Lord called him. Then, of course, we have Peter! One would think that impetuous coward would be the last person for Jesus to choose. Why were they chosen? They were called not because they were perfect, not because they were shining examples of high standards, but rather because their sense of the need for God's grace kept them on the edges of life and away from the smug infertility of those who feel that they have got it all together. Today's story about Peter is a classic example of God's unpredictability and Peter's missing the point. Jesus preaches from Peter's boat and then asks him to pull out to make a catch of fish. In matters of fishing Peter was an expert and Jesus a dumb carpenter. "Master," Peter points out, "we worked hard all night long and caught nothing." He knew that fish came to the surface in the sea of Galilee only at night and if you did not get them then you would never get them. But to humor the celebrity he agreed to take Jesus out to fish. When he does, their nets are filled to bursting point and they have to ask the help of other fishermen to bring in the catch. Peter got the point very quickly. He immediately saw his own pride and self-centeredness in the presence of Jesus. He begged Jesus to go away and put distance between his sinfulness and Jesus' holiness. But here again Peter got it wrong. It was only when he felt sinful and empty that Jesus could call him and fill him and make him a fisher of people. Up to this point he had been too full of himself to allow God in. Now he is told that sinfulness is not a barrier to keep God out: it expresses a real need for God to come in. Peter is the first person in the Gospel to acknowledge his sinfulness; he is also the first person to be called by Jesus. The Good News of the gospel is that God does not get nervous at the news of our sinfulness. He can handle sinners. Our God is one who gives sinners a new start. The scribes and pharisees liked to keep people prisoners of their sins but not so for Jesus. He moves Peter from protestation of sinfulness to the work that is ahead of him. It is important that we acknowledge our sinfulness but then to get up and live again - trusting not so much in our own goodness as in that of God. 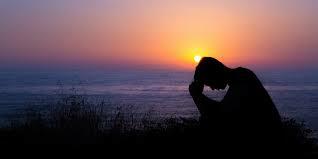 Prayer is a time for being before God as we truly are. We do not have to be good, as so many think, to enter into God's presence. When we are there, not denying our sinfulness or wallowing in our failures, the Lord raises us up to be humble fishers of other people. For the Lord, the humble are exalted and the exalted are humbled. Indeed, for Jesus, "up" often means "down" and "down" often means "up." 11. A week ago in the United States (last year) there was the playing of the championship of professional football, a/k/a Super Bowl Sunday. The contest was between the Baltimore Ravens, (their team name derives from the famous poem by Edgar Allen Poe who was born in Baltimore) and the San Francisco 49ers, (named for the gold prospectors who came to northern California in 1849). These two teams represented their respective cities. Millions of people gathered to watch the game on TV of course, but those who do not know much about football watched, yes it is a fact, the commercials. The TV company even allowed total access to all the commercials at any time. Companies spend millions of dollars for a thirty second spot for their most creative advertisings. So there were in fact two contests and two winners: one athletic and the other financial. Even the advertisements get evaluated and rated by experts. The first advertisement on behalf of God in today’s Eucharistic liturgy is from the Book of Isaiah and is the narrative of his being called. Isaiah is in the temple and has the vision of which we hear. He is aware that he is in the presence of the very Holy One of Israel. His response is natural and healthy. The closer the Holy, the less holy seems the human. The seraphim (the name means “The Burning One” in Hebrew) takes a coal from the altar’s fire and touches the lips of the prophet-to-be. He knows he is like the people with whom he lives and to whom he will be sent to advertise the holiness of God. He then hears the voice of God asking about whom God might send. Isaiah, now unburdened by his own sin, responds immediately. Peter in today’s Gospel, was doing his usual thing, except the fish were not available nor receptive to Peter’s ways of catching them. This emptiness allowed him in turn to be available for the reception of both good fishing advice and a Super Bowl of fish. Jesus was in his teaching mode advertising his new way of looking at one’s self, ones neighbors and ones world. As any good teacher does, Jesus is going to employ a visual aid. He presents Peter with a vision, a Super Something by which he will catch Peter’s attention and spirit. As with Isaiah, Peter’s response is self-inflicted shame and negativity. Peter does say his truth, “I am a sinful man.” Jesus does not deny that. Actually following Jesus will reveal even more of that self-truth to Peter. 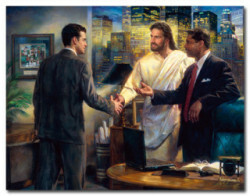 Jesus is beginning to collect his team of advertising agents. The liturgy and the Gospels continue calling us by helping us sense a deeper need than commercials can touch. The emptiness of Peter’s nets is a worthy symbol. He certainly had to face the fact of his not having, not being the fisherman he wanted to be and thought he was. This self-inflicted negativity is a normal response to a something, a certain not being which is characteristic of us as humans. Commercial advertisers offer us products which will touch slightly this zero-point, this nothingness which hums quietly all the time and now-and-then shouts out. Jesus embraced our humanity by being one of us, born with us, come fishing with us. He embraces Peter’s emptiness, fills it, but just temporarily. Peter will want more, want to be more, have more. That human-humming is a gift of the Creator which allows our availability to the more of God’s love. The most difficult thing about our being human is living as a human. Jesus came to save us, not only from damnation, and not from being human, but from being sucked in by all the false advertisers of this world who want us to run and hide from our being human and embraced by God. Peter was freed from the negativity of being a poor fisherman and given the mission of continuing the divine embrace to all his brothers and sisters. We may have enjoyed watching the Super Bowl and perhaps enjoyed even more the commercials. Perhaps, like me, you counted how many needs they tried to convince you that you had and have. We can Give the best ones our highest rating and begin laughing at how gullible they think we are - and they’re right.